WASHINGTON (CN) – With dust beginning to settle on its records request concerning President Donald Trump’s U.S. Supreme Court nominee, a transparency watchdog pushed a federal judge Friday to light a fire under the Justice Department. Though Trump only nominated Neil Gorsuch of the 10th Circuit on Jan. 31, Washington-based Fix the Court says its request for records on Gorsuch was already over a month old at that point. A nonpartisan group that advocates for reforms that would make the Supreme Court more transparent, Fix the Court says it filed its request on Dec. 22, requesting “all complaints, correspondence and any performance reviews or reprimands” involving Gorsuch between 2005 and 2006, when he was serving as deputy attorney general in the Justice Department. 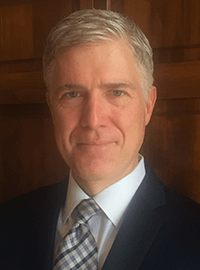 It was known in December that Gorsuch was on Trump’s shortlist of potential judges to fill the seat left open after the death in February 2016 of Justice Antonin Scalia. In a statement announcing the lawsuit Friday, Fix the Court executive director Gabe Roth said the records his group seeks could show whether Gorsuch had a role in creating U.S. policy on the treatment of detainees during the War on Terror or in the discrimination against liberal lawyers who applied to the Justice Department, as revealed in a 2008 inspector general report. Like the group’s regular practice of requesting and posting online financial-disclosure forms for potential justices, Fix the Court said Gorsuch’s employment record with the Justice Department would help shine light on a person who might well fill a lifetime seat on the nation’s highest court. The Justice Department confirmed receipt of Fix the Court’s request on Jan. 26, but said it falls within “unusual circumstances.” Saying it needed an extension to reply in full, the DOJ said Fix the Court’s request “requires a search in another office,” according to the complaint. Fix the Court has not heard from the Justice Department since, blowing past a statutory time limit in the Freedom of Information Act, the group claims in the complaint. A Department of Justice spokesperson declined to comment on the suit.